We are committed to making Netroots Nation not just diverse but an inclusive, positive, collaborative and safe experience for everyone who attends. Use of threats or violence is never permitted and will result in the immediate revocation of credentials. We encourage freedom of expression, including the right to peacefully protest, and recognize that such actions can be vital to shifting the political conversation. At the same time, we aim to ensure that all attendees can take full advantage of all opportunities available at this conference. If a protest is disruptive or sustained, we may relocate the action to another space so the program can continue. During social events and discussions, encourage others to join in. Keep an empty chair or open space in your circle for newcomers to help them feel welcome. Open up to others in your conversations. If you notice people dominating a discussion, ask for feedback from quieter attendees. Cut one another some slack. Not everyone comes from the same shared knowledge base or social framework. Aim to learn from differences of perspective. Ask questions and share insights with an open heart. Avoid dismissing the ideas of others, even if they do not align with your personal beliefs. 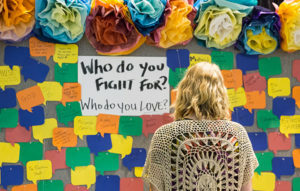 Netroots Nation is committed to creating a safe, inclusive space for all our attendees—regardless of sexual orientation, gender identity or expression, ethnicity, religion, age, physical limitations, immigration status or economic status. We strive to create a community grounded in solidarity, equality and respect. It is our collective responsibility to ensure that each member of that community feels welcomed and respected. Harassment, discrimination, violence and bigotry create feelings of fear, uneasiness, humiliation and discomfort. Even if our actions are not intentionally hurtful, what we say and do can hurt others or make them feel uncomfortable. Sexual harassment is a form of sexual violence. Sexual harassment is any unwanted attention of a sexual nature. Examples may include remarks about another person’s appearance or dress, unwanted flirtations, touching someone without their permission, unwanted sexual pressure and verbal abuse and name calling. We want our attendees to have a great time, but please remember that sexual consent is always essential. And if you use alcohol, please do so safely. Alcohol use is never an excuse to disrespect, harass or harm others, and someone who is intoxicated may not be able to give their consent. If you need to report an incident to the police, please call the local authorities. You can also call RAINN’s National Sexual Assault Hotline at 800-656-HOPE (4673), and SurvJustice.org provides legal guidance to survivors of sexual violence. Netroots Nation reserves the right to revoke, without refund, the credential of any attendee not in compliance with this safe space policy. There’s always progress to be made on this front, so we welcome your ideas. Got a question, concern or feedback? Contact the Netroots Nation staff.